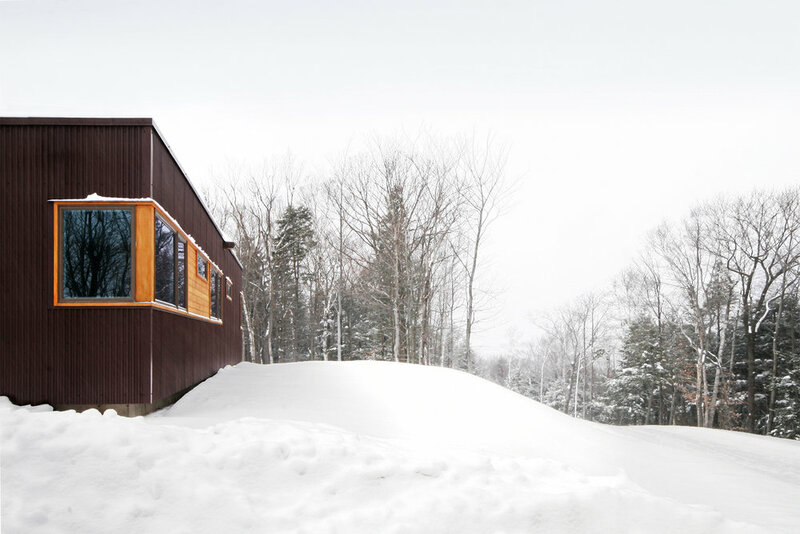 Isolated in the Green Mountain National Forest of Vermont, this 1,650 sf prefab home is an escape for a retired Brooklyn couple. With no electric or cell phone service, this ‘Off-the-Grid’ home functions as the common gathering space for the couple, their three grown children and grandchildren to get away and spend quality time together. The client, an avid mushroom hunter and connoisseur, often transverses the 200 acre property for the delicacy, then returns to her home which rests on the top of the mini-mountain. With stunning views of nearby Stratton Mountain, the home is a ‘Head & Tail’ design, where the communal space is the ‘head’, and the private bar of bedrooms and baths forms the longer ‘tail’. Together they form an ‘L’, creating an outdoor terrace to capture the western sun and to enjoy the exterior fireplace which is clad in cement board panels, and radiates heat during the cool summer evenings. Just inside, is the expansive kitchen, living, and dining areas, perfect for preparing meals for their guests. This communal space is wrapped with a custom Baltic Birch bookshelf and window bench so one can soak up the south sun and view of the fern meadow and surrounding wilderness. With dark bamboo floors over radiant heating, and a wood-burning fireplace, the living area is as cozy as can be. 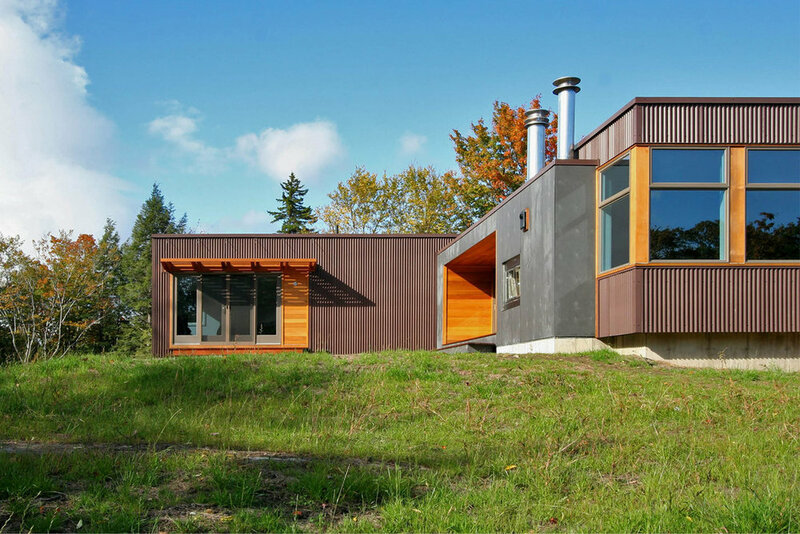 The exterior is clad in a maintenance-free corrugated Corten Kynar painted metal panel system to withstand the harsh Vermont winters. Accents of cedar siding add texture and tie the strategically placed windows together. The home is powered by a 3,000 KwH solar array with a back-up generator in case the sun is hidden for an extended period of time. A hybrid insulation system, combining both a closed cell spray foam insulation and batt insulation, along with radiant floor heat ensures the home stays airtight and warm in the winter.